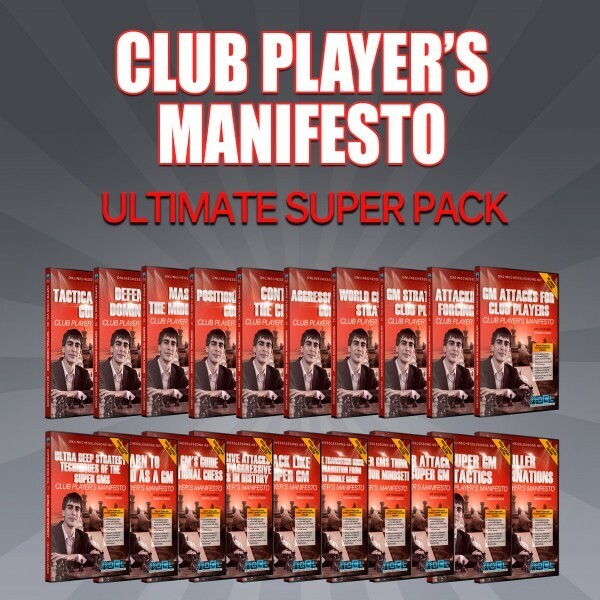 The Club Player’s Manifesto Series employs an innovative approach to learning the core essentials of chess for club players up to Candidate Master, guided by Grandmaster Damian Lemos, one of the World Leaders in Chess video series presentation brought to you by iChess.NET, and sold on the ICC store. This super-pack includes all 20 video series by GM Damian Lemos as he explains his route from club level to the Grandmaster title. Viewers will learn how Grandmaster Lemos approaches chess training and how you can design a similar regimen for success as he goes into great detail explaining key concepts related to all phases of the game. You will develop a complete opening repertoire for the white and black pieces and also learn about common resulting middlegames from these openings, and the best long-term strategies to utilize. Grandmaster Lemos will teach you about GM-level tactics and endgame technique, guaranteeing you improve your chess in a truly holistic manner. Your entire chess game (and results!!!) will skyrocket after studying this 50 hour chess course by GM Damian Lemos. The Official Course for aspiring ‘Candidate Masters’. Dozens of relevant practice problems per volume of a structured 10 video series set. The most comprehensive club players “video series course with materials” ever released. PGN files included free for every volume. In this volume the emphasis is on basic and advanced concepts of ‘Attacking the King’ and the many factors leading up to the attacking possibility. Before the attack commences there is explanations of how it happens, this is done by examining a theoretical opening, followed by examination of the middle game skills that enable the attacking possibility, followed by how the attack is correctly conducted. This video series follows on from the first video series in The Club Players Manifesto, which had emphasis on basic and advanced concepts of attacking the King and the many factors leading up to the attacking possibility. This chess video series looks at ‘Strategy’ and discusses the many strategical openings, then breaks down the strategical elements of each game and some of the key concepts are identified. This volume builds upon volume 3/10 ‘Strategy’ which discussed the many strategical openings primarily using game examples from ex World Champions. Emphasis is also given to ‘The Bishop Pair’ and the advantage and disadvantages in various situations. This video series has emphasis on ‘Aggressive Play’ using The Initiative, Central Pressure, Lateral entry for pieces and harnessing Bishops. There is also explanation of the opening running up to the aggressive play situations. This volume has emphasis on the ‘Center’ how to stake an advantage there, once secured, how to then approach with an attack on a different part of the board. Discussions of the theoretical openings and their control of the centre is also considered. In this volume GM Damian Lemos looks at ‘Positional Play’ things like voluntarily giving up ‘The Bishop Pair’, How to attack doubled ‘C’ pawns, Placing Rooks deliberately on Closed files, The IQP advantages and disadvantages and many more Positional Play methods. This volume has emphasis on the ‘Middle game’ looking at ideas and concepts based around Pawn Structure, Bishop Pair, Kings Pawn Cover and many more elements. The opening is also considered on the lead in to the resulting middle games. This volume looks at ‘Defense’ and how to stay calm in the face of attack with concise understanding of opponents threats. Preparing your defense against expected attacks is considered as is the use of tactics. This volume looks at ‘Tactics’ and how a Grandmaster thinks in tactical situations. Searching for surprising moves, opening lines to the King, King Hunt, In-Between moves, Removal of Key Defenders and many more tactics are considered. This volume shows us the secrets of chess strategy at the highest level through extensively-analyzed master games. Emphasizing the correct plans and ideas at every moment, it is a series for advanced players to complement their training with an aspect more difficult than tactics. You will learn the art of defense, just like the GMs employ when they need to defend themselves against the attacks of their opponents. It is important to learn the basic concepts of defense in order to avoid suffering painful defeats due to not knowing how to react. Defense is sometimes a difficult task and a part of the game that many players do not like, often even avoiding positions where they have to defend themselves, despite it being the best option. This volume consists of studying the strategic game, while acting as a guide for learning how Super GMs dominate positional chess. Over the course of these videos you will see master games explained in-depth by GM Lemos, placing emphasis on every move, explaining the motive and the distinct reasoning and thinking that causes GMs to make certain decisions. You will learn how to attack and play aggressively right from the opening, to practice calculating and the possible attacks available in various positions, initiative and constantly threatening your opponent. GM Damian Lemos reveals the ideas of the middlegame and explains to you how a GM thinks throughout the game. It also focuses on how Super GMs calculate and teaches you to change how you think. This work is presented across extensively-analyzed and annotated games in which GM Lemos explains the plans and ideas behind each position after every move. This video series presents the guide for transition to the middlegame, how GMs plan the passage from the opening to the middlegame, paying particular attention to how the choice of opening decides the plans on how to follow on to the middlegame and the endgame. During the middlegame, the player can lose the advantage they obtained in the opening if they do not know how to correctly enact their plan; just as it happens to experts in endgames. If you do not obtain an advantageous position in the middlegame, it will be very difficult to achieve victory in the endgame. Many players know how to attack, but lack the ability to coordinate material and create decisive threats towards a particular objective. It is important to not only know how to evaluate a position and determine whether you can attack, but also the most effective way to transfer your forces into attack. Not doing this correctly could cost the player the game. Counterattacking, a powerful weapons in our repertoire, is one of the important facets of the game that we see in these videos. Often we need to defend and wait for our chance to counterattack; this tends to be very effective as our opponent goes from attacking to having to defend themselves which they don’t like to do. Counterattacking is often more effective against an opponent’s poor defense when they are unable to adapt to the new situation. Tactics often complement a prepared strategy and you will also learn how to punish an opponent for ignoring certain norms of the game, such as development, gaining material in exchange for a loss in tempo and you will see the importance of initiative and prioritizing development over material. GM Damian Lemos focuses teaching you certain combination tactics that bring about forced mate or gaining material by meticulously scrutinizing 4 Super GM games in order to explain how Grandmasters think. There are a lot of tactical themes that should be known and certain typical combinations that all players should know. There are simple combinations with few moves to gain material in the short term and other more complex and difficult ones that require longer precise calculation and can bring about mate or gain material but not immediately. I am not a strong player -- peak rating 1925, currently around 1800. There was very little on these videos I didn't already know, tactical points were very rudimentary, and the pace very, very slow. I would recommend this series, perhaps, for 1200-1500 or thereabouts. Though just started with the lessons it gives me (rated approx. 1750) structured instruction. To the point, not too fast and not too slow tempo. Almost eyery question that pops up in me, is answered directly furtheron in de explanation.